William Kuralek was a Canadian artist (1927-1977), the son of Ukranian immigrants. As a 12 year old boy he dreams of the birth of Christ in different northern settings. 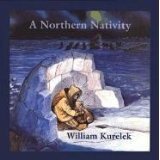 His thoughts are on one page; the facing page is a picture of the Baby Jesus, Mary, and Joseph at the site of his dreams-a logging camp, a Salvation Army shelter, an igloo, an Indian hunter’s cottage, a fishing hut, altogether 20 different location. In one picture the family is Inuit, in another the family is black. The time is in the 1930’s when work, food, and shelter are hard to find. In William’s dreams, people respond in different ways-with love and welcome, with indifference, with rejection. Some of the world’s greatest artists have painted the birth of Christ but most of them have been European artists. Until recently children’s picture books sanitized and anglicized the nativity to the extent that much of its meaning was lost. Kurelek, using colored pencils and ink, offers a bracing breath of northern air, each setting filled with love, joy and tenderness, and also with harsh conditions and urgent needs. Except for the central characters, no scene is familiar. We read many Christmas books with our five children; alas, this was not one of them. It was not published until most of our children had left home. In fact, it was one of our daughters who introduced me to it. I have used it with children in the church and given it as gifts. But I read it myself, with or without children, each Christmas. Who would have seen the miracle? Who would have brought the gifts? The book compels the reader to answer. Virginia Thomas has shared her love of children’s books with children and adults for many years. As an avid collector of nativity scenes, she has always looked for those that might reflect those who hear the story of God’s love in their own culture. Advent Gifts: A Northern Nativity by Storypath is licensed under a Creative Commons Attribution-NonCommercial 4.0 International License.